Nutri-West has a state-of-the-art manufacturing and shipping facility with distribution centers throughout most of the world. Nutri-West offers continuing commitment to the health care professions by marketing their products through chiropractors, nutritionists, medical doctors, and other licensed health care professionals. COMPLETE OMEGA-3 ESSENTIALS provides nutritional support for a multitude of health categories including Chronic Pain, Inflammation, Cardiovascular, Osteoarthritis, Normal Brain and Nervous System Development/Function, etc. Two soft gel capsules contain: EPA 600 mg, DHA 300 mg, ALA 100 mg, GLA 100mg, Vitamin E (D-Alpha Tocopherol natural 100 i.u. ), Mixed Natural Tocopherols 4 mg. Dr. Dan Murphy, D.C. recommends that COMPLETE OMEGA-3 ESSENTIALS be taken with COMPLETE OMEGA-3 CO-FACTORS for best results. This article also pointed out that fish oil acts on receptor operated calcium channels. Calcium channel blocker drugs, used to regulate High Blood Pressure, operate on a similar mechanism. Additionally, the effect on gene expression, of factors such as cytokines, adhesion molecules, and nitric oxide synthase, can affect cell membrane receptor proteins, which alters the membrane’s sensitivity to inflammatory mediators. This is yet another way in which fish oil can modulate the inflammatory response. Announcing the new 21 day “Nutri-West Detoxification Cleansing System,” a detox program formulated by a nutritionist PhD to be safe and effective. 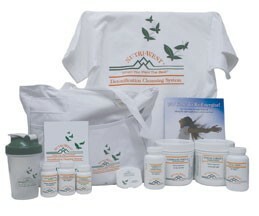 The Nutri-West Detoxification Cleansing System helps patients to re-energize and take charge of their health. It clears the toxic sludge that impedes them from feeling their best. The Nutri-West Detoxification Cleansing System is more than a 21 day program – it is a comprehensive system that educates patients on nutrition and healthy choices for life. Many detox programs call for harsh fasting, too little protein or too much protein (the brain would die without carbohydrates for energy). Some recommend limiting meals to vegetables and fruits for weeks, but too much fruit unbalanced by protein and good fat is detrimental for blood sugar homeostasis. The Nutri-West Detoxification Cleansing System includes a 24-page easy-to-follow instructional booklet to provide the information necessary to walk a patient through Pre-detox, the 21 Day program, and Post-Detox. Additionally, the booklet contains tasty, filling menu suggestions and the guidelines to maintain a healthy lifestyle after rebuilding. Also included are a 21 Day Journal for charting progress; a starter kit of the top five suggested cleansing products; a shaker cup for protein shakes; a pill box to carry suggested supplements; a t-shirt; and a canvas bag with pockets to hold detox kit items.